In a year of doing this job (today is Kitchenette's one-year anniversary), regular readers will probably notice that there's one subject I've almost entirely avoided, and it's one to which most food websites devote an inordinate amount of bandwidth: chef culture. The fact that I've largely ignored it (and no, Guy Fieri doesn't count, he's less a chef than he is an endlessly fascinating piece of walking performance art) isn't an accident. Too much of the time, food writing sacrifices accessibility for a slavering obsession with the goings-on of big name chefs, their restaurant expansion plans, their philosophies — and much of the time, this obsession is centered on the idea that chefs are the only ones who could have something to say about what we eat. This insulting, reductive, pernicious notion that only chefs are allowed to talk about food, that only their opinions matter, is as laughable as it is elitist. There are a lot of reasons Jessica Saia and Isla Bell Murray's Kid Food Reviews series for The Bold Italic is fantastic, but my favorite aspect of it is how it so deftly shears away all pretense from the notion of high-minded cuisine. Viewing haute cuisine through the lens of a kid and free from the notions of popular culinary propriety makes it abundantly clear how seriously we shouldn't be taking our understanding of the conversation surrounding food. This is not to say chefs don't have a lot to offer, nor that their expertise shouldn't be respected. And sure, when you're talking about food preparation, or the particulars of specific ingredients, the voices of those with cooking experience are the ones that should — and do — matter more than everyone else. * They're the professionals, and by their very nature, they're the unquestioned experts when it comes to making food taste great. And their culinary creativity should be celebrated and given attention — anyone willing to push frontiers and do new and interesting things has a voice that should be heard. But they sure as hell aren't the only people with something relevant to say, no matter what some of them — and a significant contingent of society — would tell you. The dirty secret some chefs hate to admit is that when it comes to talking about food and what it means to us on an individual level, their opinions should carry the exact same amount of weight as literally any one of us, and not one iota more. A lot of chefs think that just because they can prepare a great meal, they're also the only ones who can enjoy a great meal — or make fun of a bad one. This is the dumbest opinion imaginable (yes, even dumber than this). 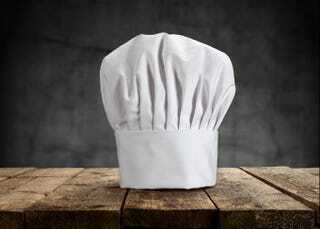 Chefs are the gatekeepers of the knowledge of how to cook. They are not the gatekeepers of the knowledge of how to eat. They do not get to decide what food means to any of us on a personal level, nor are they the only ones with relevant experiences regarding it. There are so many things to talk about when it comes to food that the notion of one group being the arbiters of any discussion surrounding it is patently ridiculous. There is every bit as much a place for a discussion of the myriad insanities of the people behind Doritos or how milk is secretly gross or the beautiful horror of Ren Faire food in the public consciousness as there is of the proper way to sous vide an egg. More importantly, the discussion surrounding any one of those subjects isn't any more important than the others. It's important to throw out a #NotAllCelebrityChefs here. Plenty of big name chefs are popular in large part because of how accessible they want food culture to be (Anthony Bourdain has made an entire career of sharing his love and understanding of food), or how they want to share their knowledge rather than lording it over us simple peons (Wiley Dufresne is as much an enthusiastic Culinary Biophysicist as he is a Chef). Chefs who want to join in the conversation rather than control it are myriad, and they're a vital part of the discussion. This also isn't just chefs, obviously. The same standard to which they should be held applies equally to anyone who talks about food, including me. My opinions are ultimately nothing more than the dumb, ranty musings of someone who likes food and likes to talk about it. I like to think I can state those opinions entertainingly (frequently in a way that involves phrases like "pig sphincters"), but ultimately, that's the only real difference between me and any of you. The secret to writing about food is that anyone can do it; if they couldn't, I wouldn't have this job, since my entire list of qualifications appears to consist of knowing a lot of different ways to say a thing is gross and being really creative at swearwords. Food is universal in a way many other subjects aren't; anyone and everyone has something to share when we talk about what we eat. My opinions on what we eat and how we eat it are neither more valid nor more important than any of yours (except when it comes to Cincinnati chili). ** I don't seriously seek to be right when it comes to food, because there is no "right." I only seek to be entertaining. Ultimately, everyone has something to contribute when it comes to a discussion of what we eat. Anyone who tells you they're the arbiter of all food knowledge — regardless of whether they're wearing an apron and a tall white hat when they're doing it — isn't worth listening to. * I shifted from the term "chefs" for a reason, there: people who cook at home frequently have just as much to offer as professional chefs. The popular degradation of people who cook at home as compared to those who get paid for it is another elitist issue, and it's one for which I have absolutely no time. ** Kidding! I'm kidding, Cincinnati. Calm down. Man, you guys are just WAY too much fun to mess with. Seriously, though, your chili makes me question the existence of God, I haven't been just messing with you on that. It's really, really bad.